This is Network Computing's October Tech Digest on storage management in a hyperconverged world. Access is free with registration in the InformationWeek community. Just register at right. There's no cost, and it takes only a few minutes. Once done, click the "Access Content Now" button at right. 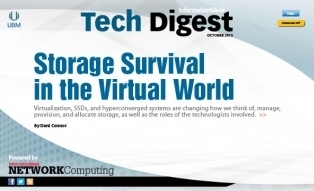 Storage Survival in the Virtual World: Virtualization, SSDs, and hyperconverged systems are changing how we think of, manage, provision, and allocate storage, as well as the roles of the technologists involved. Containers Catch On: The advent of storage- and operating system-agnostic container technology and orchestration software is transforming how people view and use VMs. Kollective Technologies | XO Communications.